Escape to the peace and quiet in an unparalleled luxury home with Hudson Valley Views atop 24 acres. This listing if for all bedrooms as private rooms. There are 3 guest rooms available, and an extra twin bed that may be added to two of the rooms if desired; we’ve hosted a couple with a small child that they wanted in the same room for example. If your party is larger than 6, and once all three rooms are taken, there is a semi-private shared space with 2 sofa’s that have a solid base cushion as comfortable as any bed. The daily rate listed is for all 3 bedrooms as private rooms while your hosts are there. We are open to renting the rooms individually for $375 per night per room. The home features plenty of outdoor spaces to unwind, a mirrored yoga studio / gym with a Precor and hand weights, 2 laundry rooms, gourmet kitchen with high end appliances, and an in-ground pool that is 42’ long by 14’ wide. Our property is also ideal for retreats and intimate events subject to extra fee’s. We’ve hosted a few Meisner acting retreats where actors had run of the house and property for improvisational scene work. 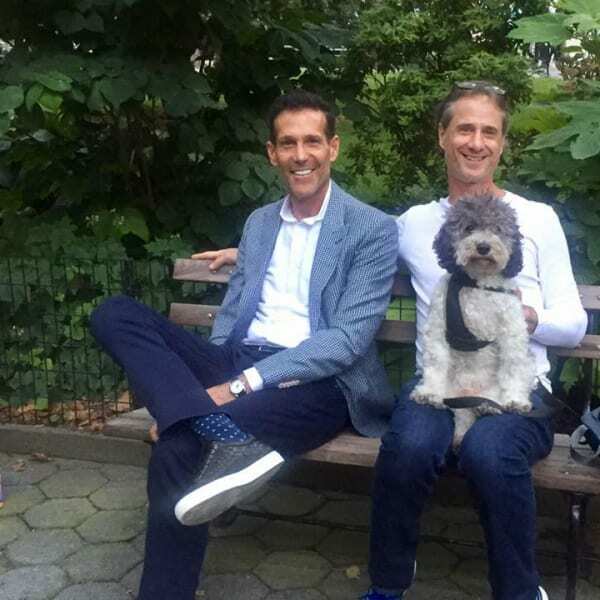 Your hosts are Gregg and Robert who have been together 24 years, and the property mascot, Cooper the Cockapoo. We are dog friendly subject to pre-approval and potential fee, however Gregg is deathly allergic to cats, so no cats, but we welcome pictures. A central tenet as a guest is respect and honor; for ourselves, for each other, and for our environment. This is not a party palace, and any event or party must be discussed and approved in advance - no guarantee. If guests wish to invite family, friends or guests, prior authorization is required and may be subject to an additional fee. Responsible drinking is welcome, and our kitchen is equipped with bar tools and blenders for the inner mixologist in you! We have a zero tolerance for recreational drugs, which are strictly prohibited on the property. Discovery of any non-prescribed or recreational drugs will result in your immediate departure. Home owner prohibits the use, sale, manufacturing, distribution, possession, or facilitation of the use of illegal drugs and other illegal substances, as well as substances that are generally recognized as dangerous and detrimental to the individual and community, even though they may not be illegal (including, but not limited to, crystal meth, cocaine, whippits, 2-C’s, NBOME, research drugs, Spice, K-2, non-prescribed performance enhancing drugs) (referred to in this policy as “prohibited substances”). - Custom designer furniture inside and out, and the manicured grounds all speak for themselves and of course must be treated with proper respect. - Notify us if you plan to use the kitchen so accommodations may be made. - Guests must be able to climb stairs as guest rooms are on upper and lower level. - Pets are considered and evaluated for a fee $195. No cats. - USE OF PREMISES. The Premises shall be used and occupied by Lessee, exclusively, as a private single family dwelling, and no part of the Premises shall be used at any time during the term of this Lease Agreement by Lessee for the purpose of carrying on any business, profession, or trade of any kind, or for any purpose other than as a private single family dwelling. This includes still and motion photography for editorial or commercial purposes. Lessee shall not allow any other person, other than Lessee's immediate family or transient relatives and friends who are guests of Lessee, to use or occupy the Premises without first obtaining Lessor's written consent to such use. Lessee shall comply with any and all laws, ordinances, rules and orders of any and all governmental or quasi-governmental authorities affecting the cleanliness, use, occupancy and preservation of the Premises. Lessee shall not allow smoking on the Premises, however smoking may be allowed at a distance from the house and you must remove all cigarette or cigar butts. ASSIGNMENT AND SUB-LETTING. Lessee shall not assign this Agreement, or sub-let or grant any license to use the Premises or any part thereof. ALTERATIONS AND IMPROVEMENTS. Lessee shall make no alterations to the buildings or improvements on the Premises or construct any building or make any other improvements on the Premises without the prior written consent of Lessor. (By way of example and not limitation, Lessee shall not install or affix satellite television or any other appliance to the Premises without the prior written consent of Lessor.) Any and all alterations, changes, and/or improvements built, constructed or placed on the Premises by Lessee shall, unless otherwise provided by written agreement between Lessor and Lessee, be and become the property of Lessor and remain on the Premises at the expiration or earlier termination of this Agreement. HAZARDOUS MATERIALS. Lessee shall not keep on the Premises any item of a dangerous, flammable or explosive character that might unreasonably increase the danger of fire or explosion on the Premises or that might be considered hazardous or extra hazardous by any responsible insurance company. MAINTENANCE AND REPAIR; RULES. Lessee will, at its sole expense, keep and maintain the Premises and appurtenances in good and sanitary condition and repair during the term of this Agreement. Without limiting the generality of the foregoing, Lessee shall: Not obstruct the driveways, which shall be used for the purposes of ingress and egress only; Not obstruct or cover the windows or doors; Not leave windows or doors in an open position during any inclement weather; Not hang any laundry, clothing, sheets, etc. from any window, rail, porch or balcony nor air or dry any of same within any yard area or space; Not cause or permit any locks or hooks to be placed upon any door or window without the prior written consent of Lessor; Keep all lavatories, sinks, toilets, and all other water and plumbing apparatus in good order and repair and shall use same only for the purposes for which they were constructed. Lessee shall not over-stuff toilets nor allow any sweepings, rubbish, sand, rags, ashes or other substances to be thrown or deposited therein. Any damage to any such apparatus and the cost of clearing stopped plumbing resulting from misuse shall be borne by Lessee; Lessee's family and guests shall at all times maintain order in the Premises and at all places on the Premises, and shall not make or permit any loud or improper noises, or otherwise disturb other residents; Keep all radios, television sets, stereos, phonographs, etc., turned down to a level of sound that does not annoy or interfere with other residents; Deposit all trash, garbage, rubbish or refuse in closed garbage cans at the side of house and shall not allow any trash, garbage, rubbish or refuse to be left in the open or permitted to stand on the exterior of any building or within the common elements. Lessee is expected to provide a reasonable amount of cleaning of the kitchen area including loading dishwasher, wiping down counters, and depositing trash with food waste in designated containers. Failure to do so will result in extra cleaning fees. Usually, late check outs often cannot be accommodated due to the cleaning schedule. Later check out will be charged $100 from the security deposit if the cleaners arrive and cannot start working. INSPECTION OF PREMISES. Lessor and Lessor's agents shall have the right at all reasonable times during the term of this Lease Agreement to enter the Premises for the purpose of inspecting the Premises and all buildings and improvements thereon and for the purposes of making any repairs, additions or alterations as may be deemed appropriate by Lessor for the preservation of the Premises or the building. Lessor and its agents shall further have the right to exhibit the Premises. SURRENDER OF PREMISES. Upon the expiration of the term hereof, Lessee shall surrender the Premises in as good a state and condition as they were at the commencement of this Agreement. INDEMNIFICATION. Lessor shall not be liable for any damage or injury of or to the Lessee, Lessee's family, guests, invitees, agents or employees or to any person entering the Premises or the building of which the Premises are a part or to goods or equipment, or in the structure or equipment of the structure of which the Premises are a part, and Lessee hereby agrees to indemnify, defend and hold Lessor harmless from any and all claims or assertions of every kind and nature. ATTORNEYS' FEES. Should it become necessary for Lessor to employ an attorney to enforce any of the conditions or covenants hereof, including the collection of rentals or gaining possession of the Premises, Lessee agrees to pay all expenses so incurred, including a reasonable attorneys' fee. GOVERNING LAW. This Agreement shall be governed, construed and interpreted by, through and under the Laws of the State of New York and the parties hereto consent to the personal jurisdiction of the courts of the State of New York. SEVERABILITY. If any provision of this Agreement or the application thereof shall, for any reason and to any extent, be invalid or unenforceable, neither the remainder of this Agreement nor the application of the provision to other persons, entities or circumstances shall be affected thereby, but instead shall be enforced to the maximum extent permitted by law. BINDING EFFECT. The covenants, obligations and conditions herein contained shall be binding on and inure to the benefit of the heirs, legal representatives, and assigns of the parties hereto. MITIGATION. In the event of a breach by Lessee of this Agreement, Lessor shall use all reasonable efforts to re-rent the Premises in order to mitigate the damages resulting from Lessee’s breach. DESCRIPTIVE HEADINGS. The descriptive headings used herein are for convenience of reference only and they are not intended to have any effect whatsoever in determining the rights or obligations of the Lessor or Lessee. NON-WAIVER. No indulgence, waiver, election or non-election by Lessor under this Agreement shall affect Lessee's duties and liabilities hereunder. MODIFICATION. The parties hereby agree that this document contains the entire agreement between the parties and this Agreement shall not be modified, changed, altered or amended in any way except through a written amendment signed by all of the parties hereto. WEATHER. The house is in a remote location. No refunds will be issued due to so called “acts of God”, weather, or power outages of less than 6 hours. A four wheel drive vehicle is required to access the property whenever there is snow. - Home owner has small friendly dog. Our property is minutes off the Taconic 90 miles north of NYC – about a 2 hour drive up the well policed Taconic State Parkway. We are very close to The Omega Institute, 15 minute drive to Rhinebeck or Hyde Park, a 20 minute drive to Millbrook, and a 30 minute drive to Hudson. For those of you who enjoy good beer and wine, there are local breweries and vinyards to check out. Gregg enjoys a good craft beer and can help guide you in this arena. For sober travellers, there are a number of AA meetings close by. Your host Robert is a friend of Bill W. and can help guide you in this arena.